I know, that's a strange title but I had to acknowledge the amazing change which took place today. My backwards Bush counter on the home page is now at 0. Mr. Bush has been replaced and our country looks forward to a new president and, hopefully, better times. 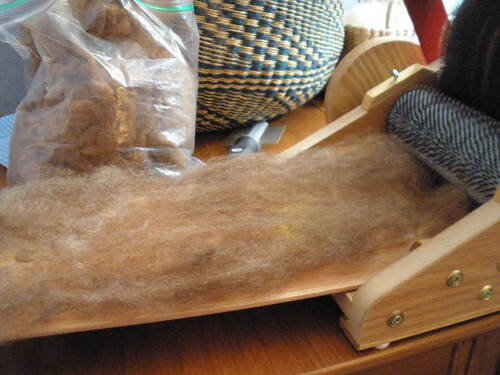 I spent the day experimenting with blending fibers on my new drum carder. I'm really pleased with the results. then put another fourth on top of the alpaca to make a "sandwich". 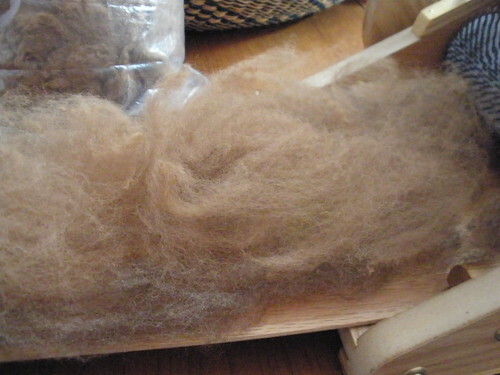 I held onto the fiber a bit so it wouldn't feed into the carder too quickly. 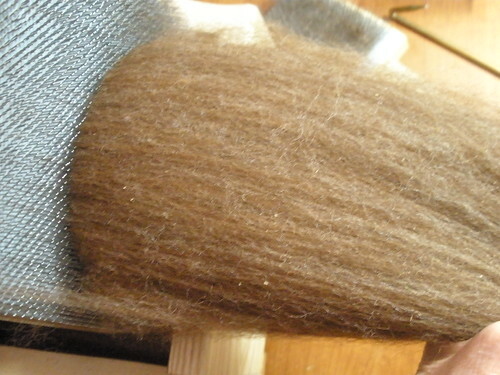 I ran the batt through the carder two more times to make it nice and smooth. I spun a little bit, just to see how it would spin. So far, so good. It spins beautifully. 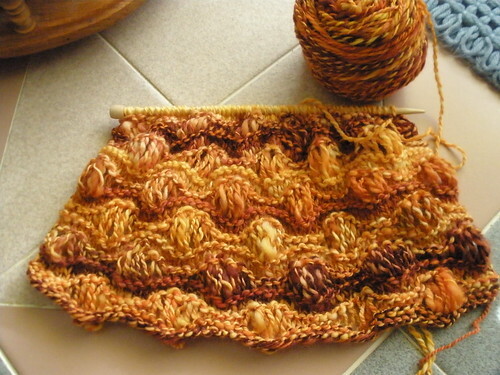 The beginning of the morning surf scarf. I like it. The pattern is easy to remember and it knits up quickly. I like how the yarn is striping. 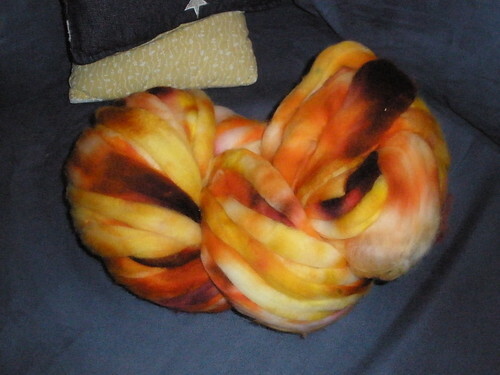 I have very limited experience with spinning dyed fiber. I usually spin natural colors. So, this is an experiment for me. 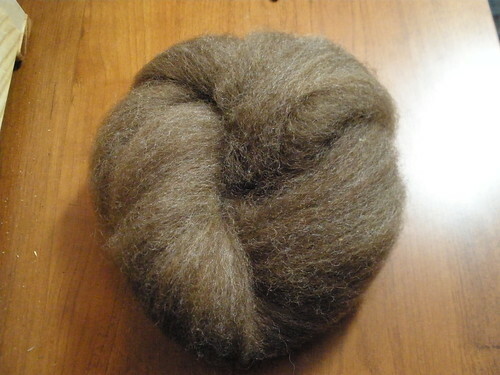 I just took the roving and started spinning, not separating or doing anything special. I just lucked out with the striping effect working this way. So, American Idol is back. Same routine in the beginning shows, let's showcase the losers who think they can sing. It still amazes me that these people are shocked when they are told they don't measure up. It's getting to the point that you can tell by what the person says before their audition whether or not they'll be good. You just know. If they say they are "unique", "different" or that they have their own sound, watch out. So far, my favorite is the young girl who finished off Wednesday night's show. Jason Castro's brother made me smile. Those guys are so laid back, so funny. Snow is falling today. Two to four inches, according to the forecast, along with bone chilling cold. I have a cold that I apparently caught from Lorelai so I'm staying inside. The nerd in me just had to do that! I knit with a group of knitters at our local Panera Bread every Sunday afternoon. 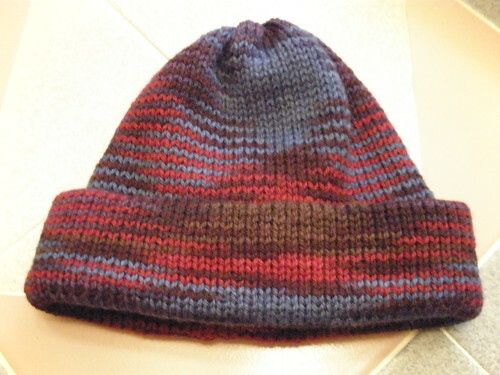 One of our regulars, Helen, made a hand knit hat for her daughter's boyfriend. When her daughter saw the hat, she said, "It's great, want to knit 80 more?" It seems her boyfriend works at an elementary school in the South Bronx. 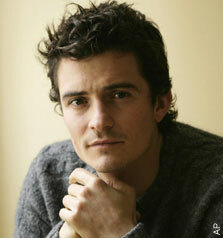 He is a PE teacher, working with autistic children. He was dismayed because most of the children arrive for school every day without a warm hat. Helen put out the call to the knitters in our group and others she participates in and the knitters responded. These hats were made by our Panera group. There are twelve hats. We'll probably have more done by next week, when we will hand them over to Helen for delivery to the kids. I made these hats a few days ago on my knitting machine. 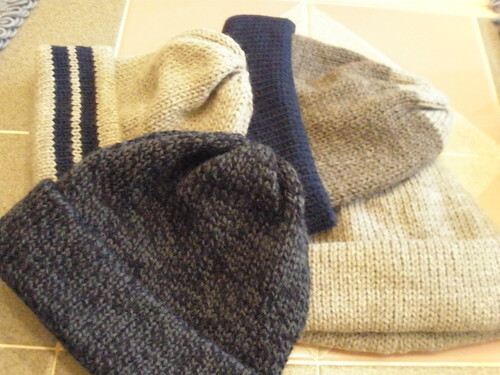 Each hat takes half an hour to knit, not counting the time to sew up the seam. I was enjoying the process so much, I made one for myself. I started knitting this one yesterday at Panera and finished it later in the evening. 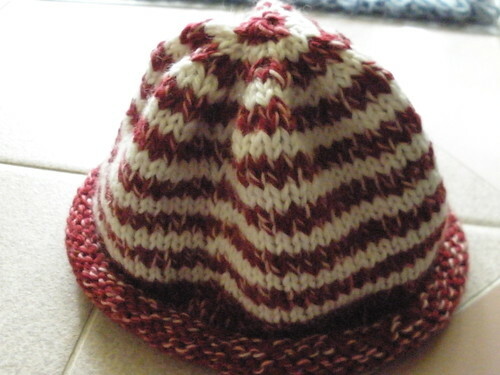 The pattern is called the 11th Hour hat. 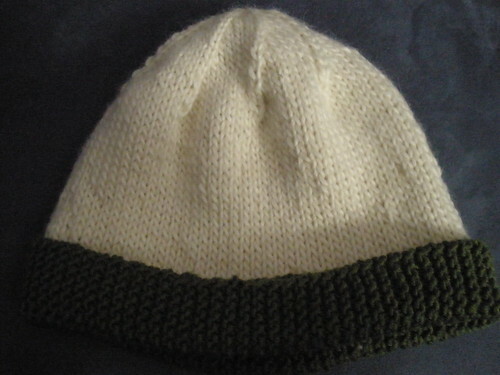 It's a fun pattern, although all that garter stitch for the brim is a little boring. It was ok working on it with people to chat with but if I were sitting alone knitting it, I'd probably go a little crazy. 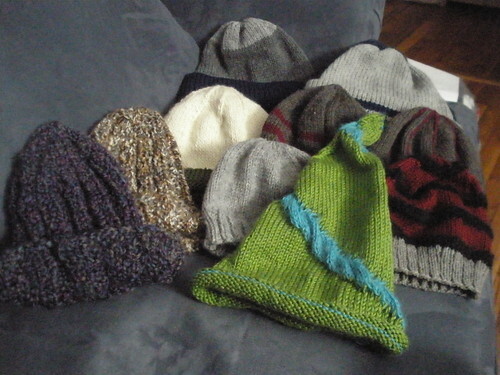 I'm planning to knit one more hat this week and possibly knit more on the machine. We'll see. Knitters change the world one warm hand knit at a time. which will eventually become a morning surf scarf. 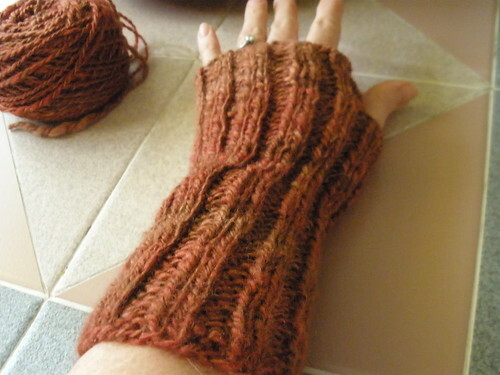 I recently finished these mitts.. I don't have a picture of the fiber I used to spin this yarn but it was a gift from Lisa. 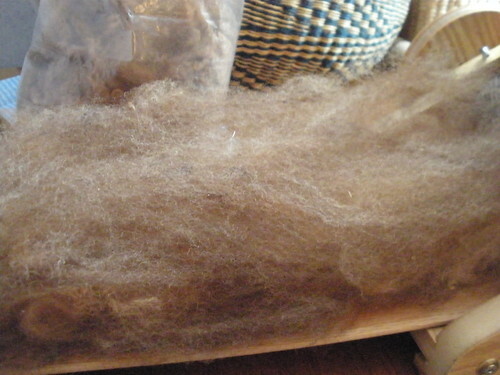 The fiber is from Briar Rose. I only see yarn on their web site, however. 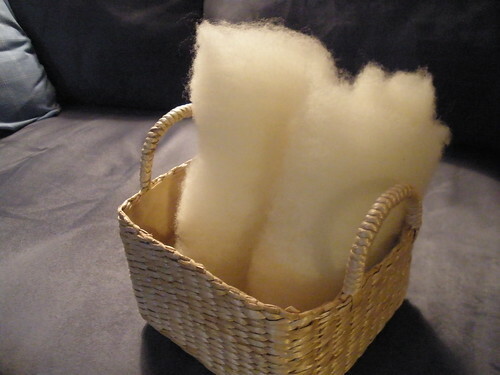 I think you can only buy the spinning fiber at shows and festivals. 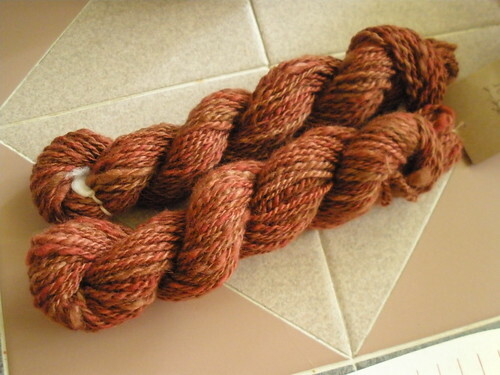 It's blue faced leicester, soft and pretty, in a colorway listed only as "reds". It's 3 ounces and I had 132 yards of yarn. I searched for a pattern to use and this one called for 130 yards of yarn. Bingo! Greetings to the handful of brave and intrepid readers of this so-called journal (aka blog). I must admit I have been positively pathetic when it comes to updating around here. My excuse is that when you wait as long as I have, the prospect of getting this up to date is just daunting. I don't even really know where to begin. But I guess my new year's resolution should be to get it in gear and just do it already. Therefore, this may be jumbled, out of order and disorganized but here I am to offer you my account of the last several months. Incidentally, if you're interested in pictures, and lots of them, you can find my pictures at flickr these days. If you click on any of the pictures in this post (and it's picture heavy), you can see more of the pictures of the event. Also, if you're on Facebook you can find me there as well. And if you happen to be a knitter, you can check out my notebook on ravelry. Ravelry is still in beta so if you're not a member, you can't view the page. If you are a knitter, request an account...immediately! In early September, Bill and I took a trip to Wisconsin for the wedding of my cousin Richard's son, Aaron. 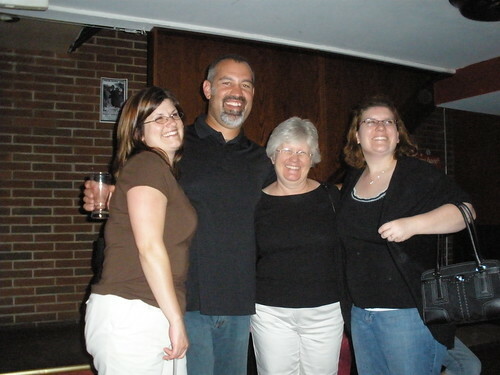 We always enjoy a big get together with members of my Mom's family. It's a warm and wonderful group and there was a really good turnout at this occasion. We flew into Chicago on Friday and then drove to Madison, Wisconsin. The flight was two hours long and it took a little over two hours to drive! We had lots of fun playing with the GPS unit. 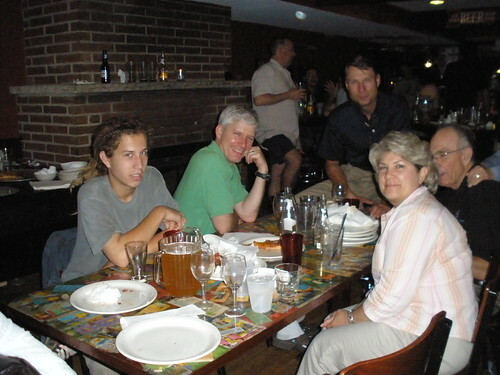 After arriving at the hotel and finding everyone, which was easy since we ran into each other in the parking lot, we went to a pizza place for the rehearsal dinner. 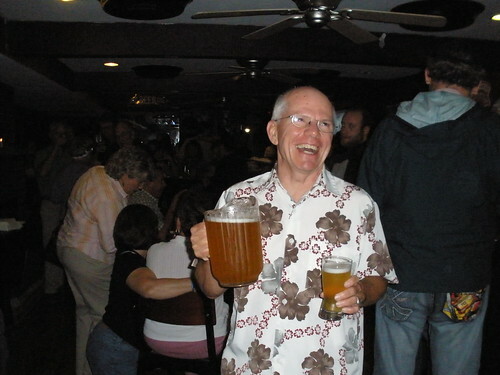 Bill kept the parents of the groom laughing. Some pictures of the family. The wedding was lovely. 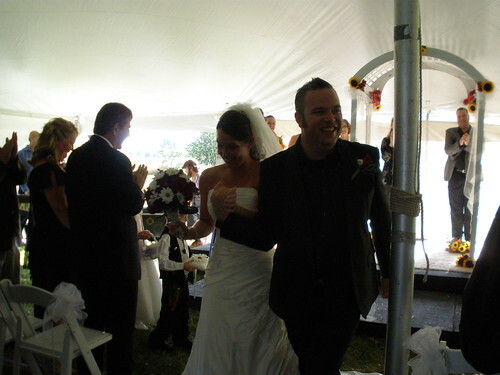 The ceremony took place outside in a tent and the reception was inside the building. It was called a barn but looked more like a Swiss chalet to me. The food was bbq! Wow, was it good! We had a clue when we sat down and found those plastic bibs next to our plates. 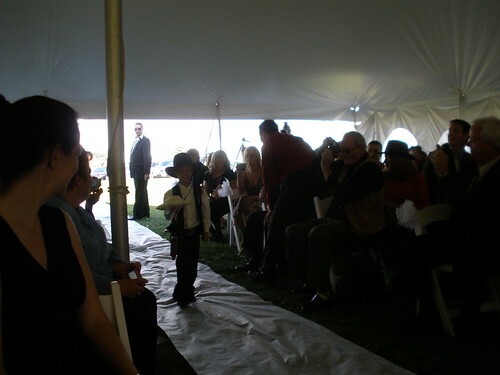 This isn't the best picture but in keeping with the cowboy theme of the wedding, the ringbearer was dressed in cowboy regalia, complete with a holster and toy pistol. So cool. 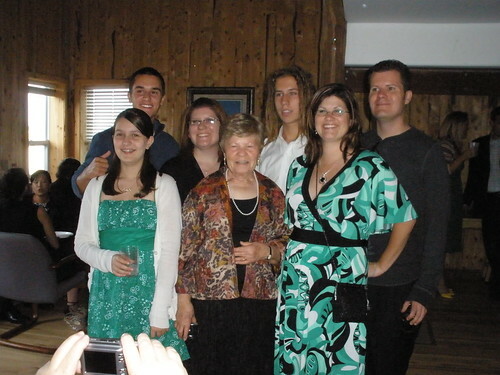 My Aunt Myrt and some of her grandchildren. 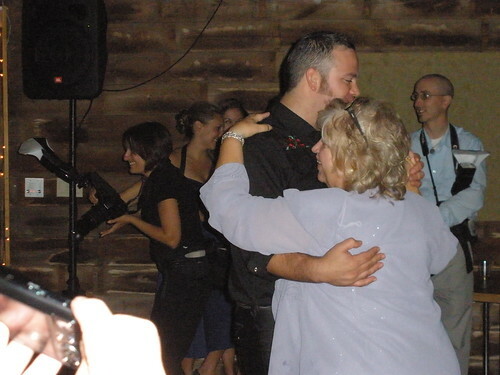 Aaron dancing with his mom, Sharon, to "Mamas Don't Let Your Babies Grow Up To Be Cowboys". I kid you not! This picture, however, brings me to the sad footnote to this story. 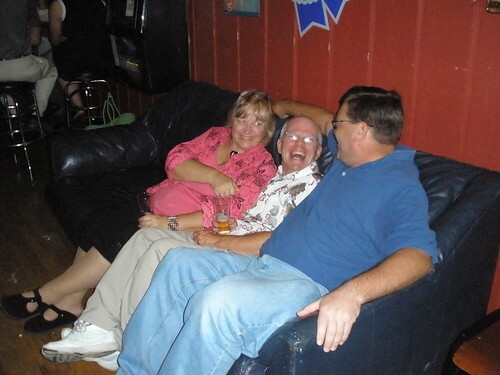 Later in the month of September, Sharon had a stroke and passed away about a month later. 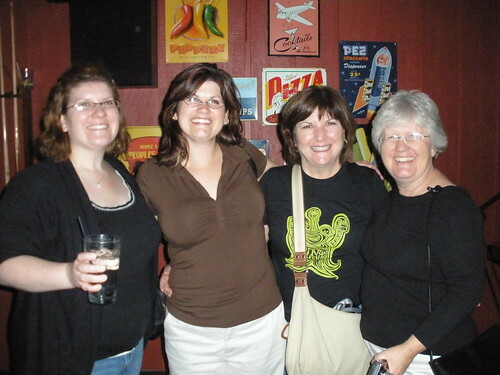 She was a warm, funny and kind woman and her death is a devastating loss for her family. We will all miss her. She left us way too soon. The wedding preparations were in high gear during this time, which is why blogging took a back seat. 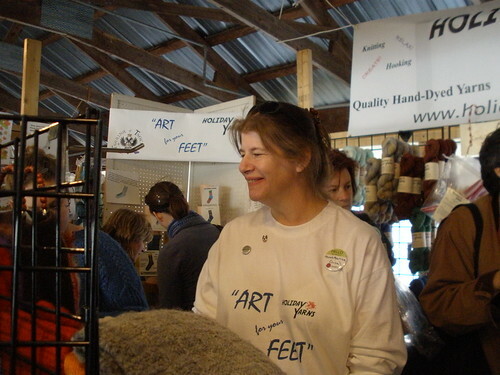 However, Bill and I did take a break for a weekend up in Rhinebeck, NY for the NYS Sheep and Wool Festival. Last year was my first visit and it was so overwhelming. There's just so much to see. I realized that this year, I needed a plan. 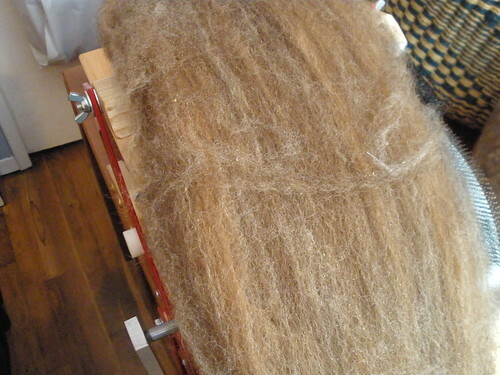 One thing I wanted to do was to scope out the drum carder I had in mind. I wasn't planning to buy it there, I just wanted to see it and make sure it was the one I wanted. 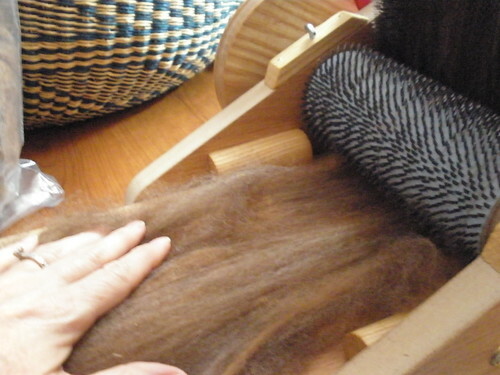 A drum carder, for the uninitiated, is a device used to prepare fiber for spinning. That's simplified but sufficient. 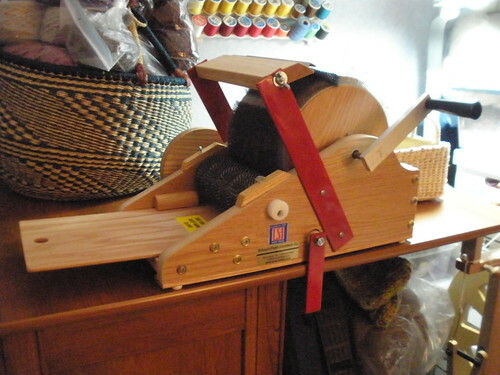 I was grateful to the fellow who manufactures the carders for the lengthy demo and description that helped me decide this was the carder for me. 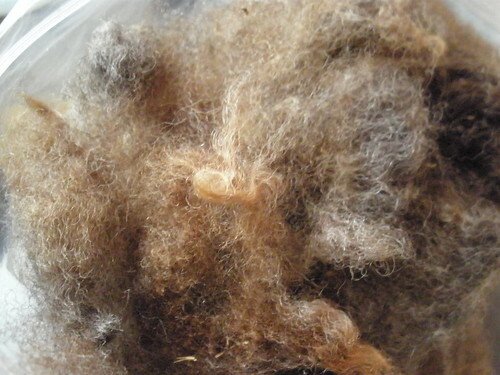 I was interested, as well, in at least one good fleece. 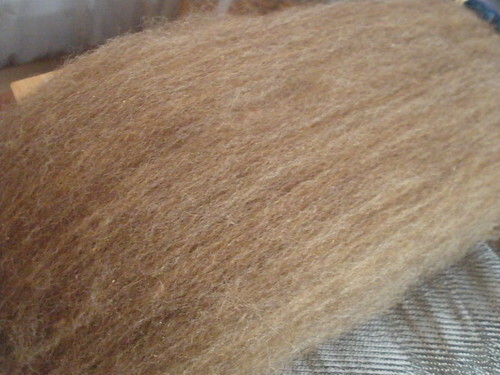 I picked up two at the fleece tent, a romney and a corriedale. When I picked up the bag with the romney, a woman stopped me and asked if I planned to buy it. I was a little uneasy. Did she have it picked out already? But she told me it was from her sheep and she hoped I liked it. 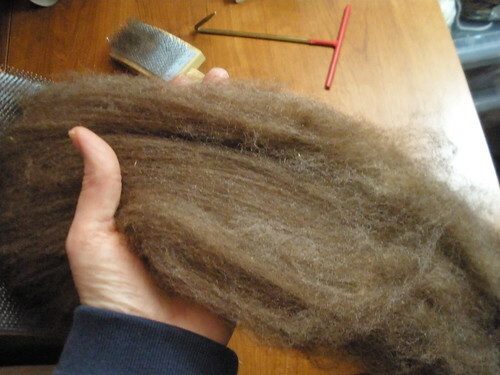 After buying both fleeces and reading the accompanying information, I realized that the corriedale is from a farm in Fairfield, PA, just outside Gettysburg. We stay in Fairfield whenever we visit Gettysburg, which is often. 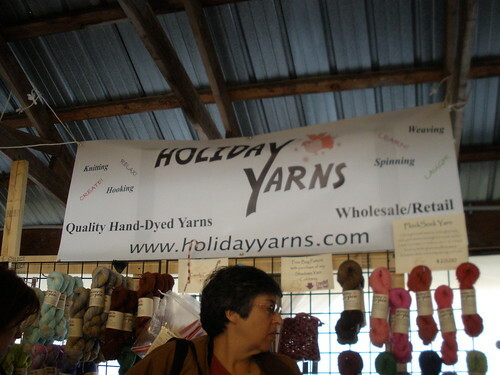 In fact, I bought handspun yarn from this farm in the local yarn shop in Gettysburg. Small world! 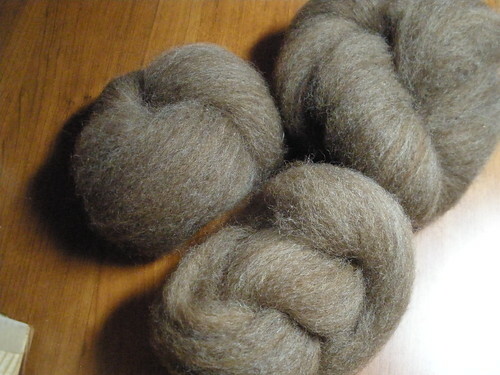 The beautiful corriedale fleece. It's over seven pounds! 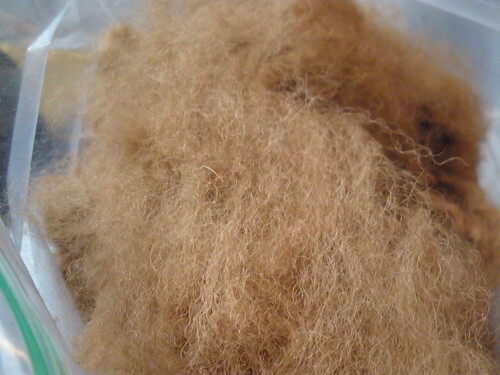 I'm still in the process of washing it but I've prepared and spun some of it. 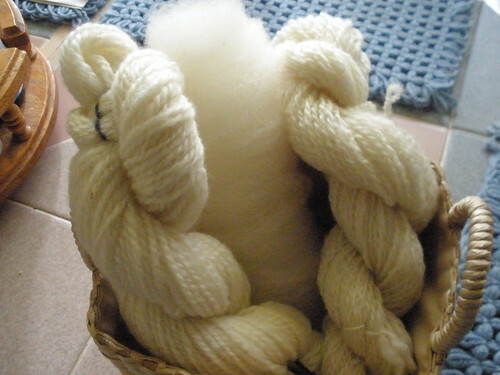 Since I got the drum carder for Christmas, here are two of the prepared "batts", ready for spinning. My friend, Lisa, aka the Tsock Tsarina, designs the most amazing socks (or tsocks). They really are "art for your feet". 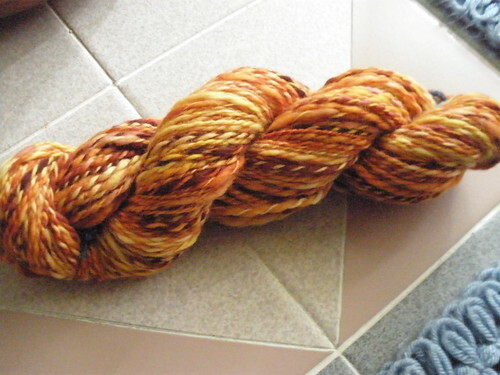 It was absolutely necessary to buy a skein of sock yarn. You believe me, right? I also bought a handmade spindle, quite beautiful, and at another booth, another spindle I had my eye on, a Bosworth. 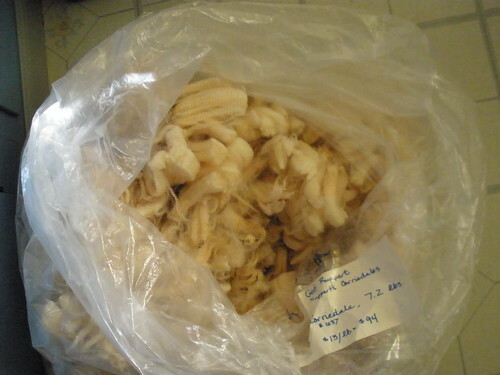 So, although it was torture, I was forced to put away all my fibery goodness and concentrate on the wedding. I did tons of research online in order to sew Kelly's gown. When she first outlined what she really wanted, I didn't even know what a corset back was. In fact, she just said she wanted it to "lace up" in the back. My research online led me to the corset back. I was infinitely lucky to find Perfect Fit Patterns, where I found a kit to sew the corset back. If the woman running this site didn't live out on the west coast, I probably would have found her and kissed her feet. This made the job so much easier. Have I talked about this before? I can't remember. At any rate, it bears repeating. Kelly's friend, Alisha, designed the gown. She essentially designed all the dresses, come to think of it. We found patterns that I adapted to Alisha's ideas. After the wedding, I asked Kelly if she had any doubts about my ability to make what she had in mind. She said no. I said, "you had faith in me?" "Absolutely", she said, "I knew you'd figure it out." That's great since I had enough doubt for the both of us! It truly was the DIY wedding. All gowns were handmade, Kelly's shawl was a two and a half month marathon for me (with planning going back a year, when I took a class to learn about lace knitting), five shawls for bridesmaids were made on the knitting machine (bless it!). The only purchased flowers were the bouquets (exquisite! ), corsages and boutonnieres. All the centerpieces were hand built by the groom and Kelly, Mike, Lester and I did the decorating of the barn. The cake was made by a friend of a friend and was delicious! Kelly and I printed the programs on Bill's laser printer. The wedding album, including some of the professional pictures (a gift to the bride and groom from good friend, Lester) are in the flickr set. Definitely look at them. Some of them look like photos of models in bridal magazines. 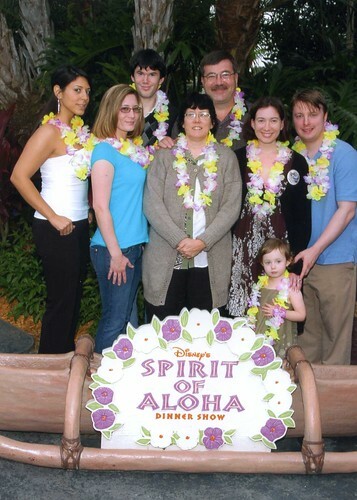 So, we all took a trip to Disney World. When I say "all", I mean, ALL of us, including Kim, Billy and his girlfriend, Amanda. In Kelly's words, "someone has to watch Lorelai". It was a blast. I wish I wasn't so tired and after everything we'd done, I was pretty darn tired, but I still had lots of fun. 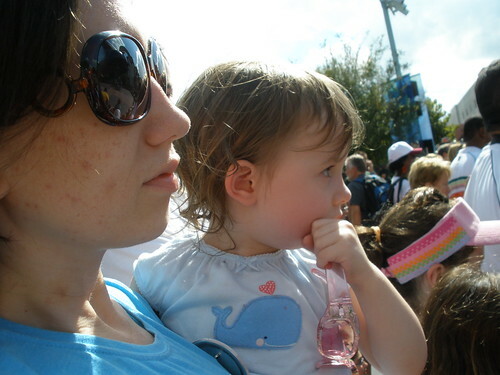 Seeing Lorelai's reaction to Disney was so much fun. Lorelai at the Princess Breakfast. 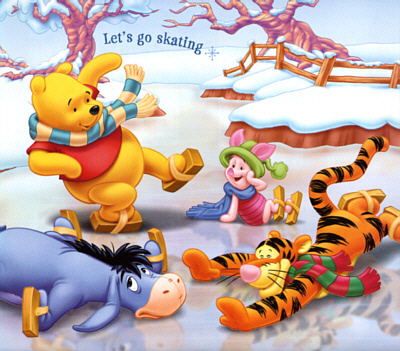 Kelly thought it wouldn't be a good idea to bring her to a character breakfast, such as Pooh, because they'd probably freak her out. We thought this would be ok, after all, they're real people. Well, maybe not. 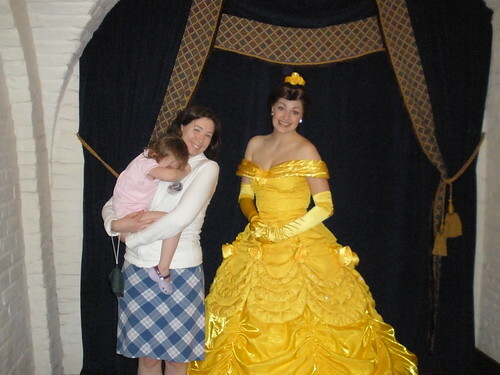 From a distance, she loved looking at the princesses but close up? Not so much. Kelly and Lorelai LOVE High School Musical. There was an outdoor show at the Hollywood Studios (formerly MGM) park. That was a big hit. Um, this picture may look familiar to many of you! It was fun and the food was great. I got up on stage and did a "birthday hula" because I have a November birthday and Mike and Kelly danced with other newlywed and anniversary couples. The only weird thing about the luau was the fistfight that occurred between a couple of guys as we were entering the facility. One guy was arrested. We got the dirt from our waitress! We thought...at Disney? Are you kidding? Once again, check out the pictures on flickr for an overview of the trip. Upon returning, I basically jumped from wedding prep right into holiday prep. Wow. 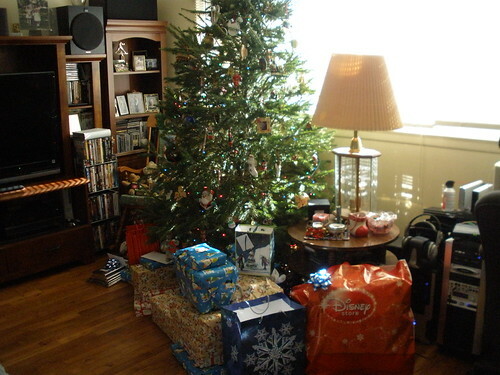 Christmas with Lorelai was bound to be fun this year. A. She's finally learned to pose for the camera and B. 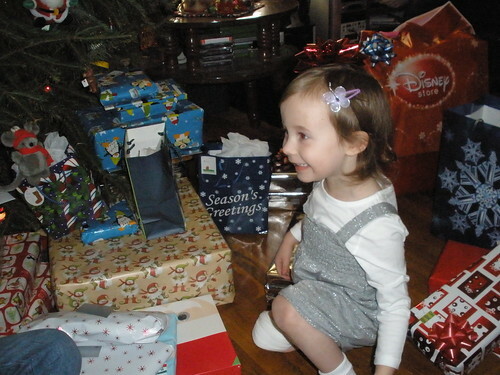 She thinks opening presents is the coolest thing ever. Yes, it was fun! We found a really nice sized tree at the firehouse this year. 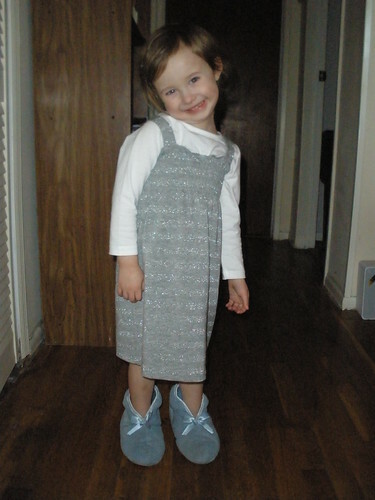 Lorelai was cute as a button, modeling Nana's slippers. And, again, more pictures are here. Since then, I've been recovering, knitting, spinning and generally enjoying myself. I think that's about it. Whew! Maybe now I can blog in real time and not in a time warp. Thanks for your patience and understanding. TTFN!